Long used in human health care, laser surgery has proven to be a safe and effective option for surgery. In recent years, this safer and least-painful option has become available for animals as well. Affordable Pet Care is proud to offer this service. 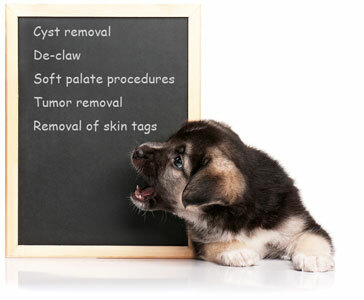 Your doctor will discuss with you whether laser surgery is the best option for your pet. In laser surgery, an extremely intense beam of light replaces the traditional scalpel. Laser energy vaporizes the water in the tissues and allows it to remove extremely small areas, while instantly sealing nerve endings and blood vessels as it goes. This means less pain, less bleeding, and less overall trauma for the patient than traditional surgery. Extreme precision – Due to the exceptionally small focus of the laser, your surgeon is able to target only the affected tissue and leave the surrounding healthy tissue untouched. Less swelling – Because only light contacts the tissue, swelling is minimal. Reduced risk of infection – The high heat of the laser actually destroys bacteria and micro-organisms as it goes, reducing risk of infection. Quicker recovery – Laser surgery reduces the discomfort your pet feels after surgery, and speeds her return to normal life.